PROJECTS is committed to the presentation and promotion of audience-engaging large-scale sculptures, installations and performances. If you are interested in submitting a proposal for PULSE PROJECTS, please contact info@pulseartfair.com. Moonlit Clouds, 2018, Silk. Courtesy of the Artist. Comprised of suspended, gossamer silk banners, Moonlit Clouds is an immersive installation that features signature cloud imagery that Miya Ando photographed in Miami in 2017. 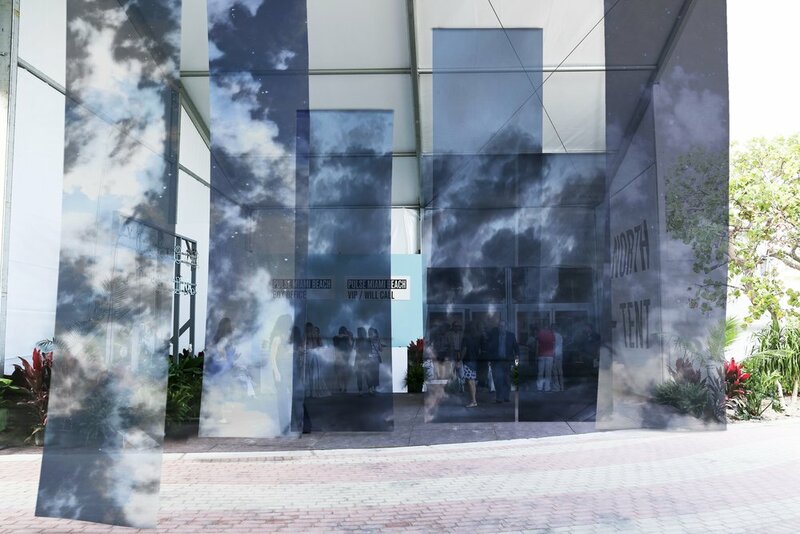 The site-specific work invites meditation and interaction with visitors, activating the PULSE tent space to create an experiential entry into the art fair. Inspired by Buddhist teachings, the banners feature unique cloud artwork that creates an opportunity for visitors to become aware of nature and the environment of PULSE. The installation explores the idea that the things we see change our state of mind with the intent to promote calmness, an awareness of inter-connectivity, and an attention to the viewer’s relationship to time and the present moment via the visual vocabulary of clouds, which connote transitoriness. The balance between the transparency, opacity, and form of the lightweight and sheer silk chiffon play with visitors’ perceptions of light and materiality, while also creating a contemplative environment.